One of the things about living on a farm is that you are surrounded by the cycle of life, the annual growth of crops and with livestock the progression from birth to death. Sometimes it’s harder to experience than other times. About 2 weeks ago our beloved horse Rienzi left us. We have had the privilege of having her with us for 28 years. She was a “mustang”, a wild horse from the Skedaddle Mountains near Lake Tahoe on the border of California and Nevada. 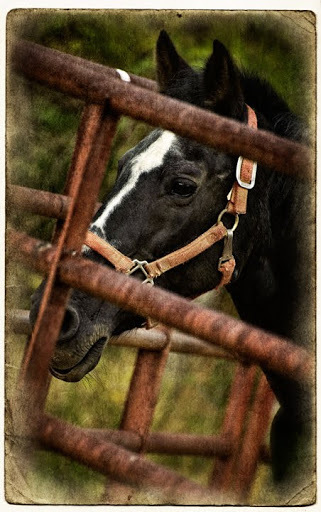 We adopted her when she was a yearling and she has shared our life and gained our respect for all those many years. The end of the cycle has been hard for us and we will miss her. My son Devin writes about her best. much like a comet through the fields. for glue and wasted fodder. alongside our small herd of cows. We’d laugh and watch her as we plowed. and rest there ’til the break of day. if we replaced sweet feed with hay. that grow between our pond and barn. She’s with her herd and on our farm. I never owned a horse, but my uncle had horses and he gave his children horses as gifts when they were young. Having an animal that close to your heart makes it very difficult when they're gone. I'm sorry for your loss. Gorgeous photos. Thanks Kalena, she was a member of the family.